The lighthouse’s white beam of light seems a perfect fit for a Carsten Nicolai (Alva Noto to music fans) makeover. α (alpha) pulse is a new audiovisual creation from Nicolai, commissioned by Art Basel for Hong Kong. And in a megapolis that does scale in a big way, the minimalist content gets a grand implementation in Hong Kong Harbor. The entire facade of the giant International Commerce Centre (ICC) – all 490 meters (1600 ft) of it – is illuminated. For fifty minutes, synchronized pulses of light and sound will beam across the harbor, connected and synchronized to mobile apps. The apps, for Android and iOS, make the sound and respond to the light. 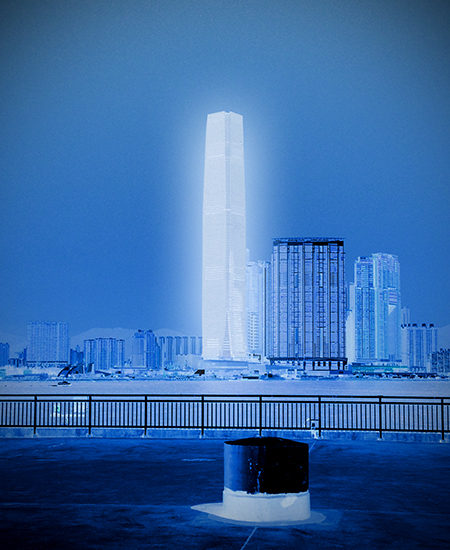 Like a lighthouse, the tower will send its pulses into the city, reaching out to Hong Kong residents and visitors. α (alpha) pulse is an experimental construction that looks at the effects of audiovisual stimulation on the human perception. In accordance with scientific research, α (alpha) pulse is based on the principles of neural feedback on pulsating light sources. The work presents an experiential set-up that explores the effects that the light impulses might have on the mood, relaxation, attention, and creativity of viewers. And in case you don’t know who Carsten Nicolai is, a full bio. Intriguingly, these days it seems his fine art career has eclipsed his music career – certainly, it seems to have done so financially. The aesthetic sensibility is the same; it’s really about venue, context, and aesthetic. It’s hard to know, though, just how deep that gulf is in awareness – or whether his club experience has informed that art in some meaningful way. Certainly, it means that the club alone can’t provide the sort of canvas his work can exploit; there’s a sense of the work here that might be appreciated by those of us who know his Raster Noton creations back and forth, but that demands, well, a giant building. Carsten Nicolai lives and works in Berlin and Chemnitz, Germany. His work is influenced by scientific reference systems and mathematic patterns, and has been presented at Documenta X and the Venice Biennale. He has previously performed his audio-visual pieces at MoMA and the Solomon R. Guggenheim Museum in New York, San Francisco Museum of Modern Art, Centre Pompidou in Paris, and Tate Modern in London. Nicolai was recently awarded the Grand Prize by The 17th Japan Media Arts Festival. The artist is represented by Galerie EIGEN + ART, Leipzig/Berlin and Pace Gallery, New York.